Samsung HW-H550 review | What Hi-Fi? The last Samsung soundbar we tested didn't quite set our hearts racing: performance flaws spoiled the HW-F750’s nice, slim profile. So can the cheaper and newer HW-H550 make amends? First impressions would suggest so. While Samsung’s higher-ranging soundbars have adopted the voguish curved design, its mid- and bottom-tier models remain traditionally straight – and in the case of the HW-H550, as slim as ever. Its rounded, cubical bar is almost a carbon copy of the Award-winning Philips HTL5140’s frame. It’ll take pride of place in front of your telly without being obtrusive. The long bar is almost completely wrapped in a black, metal-mesh grille (it’s available in silver, too). Turn on the bar, and the bold text display in the centre of the grille makes operating it simple. Helpfully, it fades out after a few seconds, so it’s not distracting during movies. 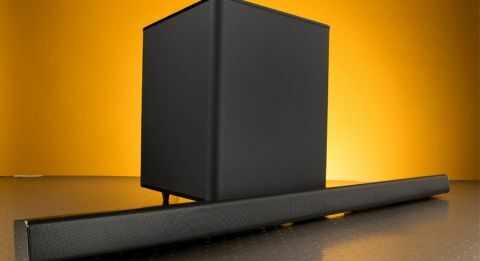 Samsung partners a skinny bar with a beefy wireless subwoofer, although the sub shouldn’t be too difficult to house and wins points for an attractive matte-black casing, with a glossy top. The convenience of wireless doesn’t end with the sub: the bar can receive (and play) sound from a TV over a Bluetooth connection – eliminating wires from the equation altogether. The catch? The TV must be a Bluetooth-compatible Samsung 3D model rigged with the company’s TV ‘Sound Connect’ feature. Sources would have to be connected directly to the TV (rather than the soundbar) to benefit, too. It’s a neat set-up, if you can access it. You can also benefit from a feature that allows you control the HW-H550 with a Samsung TV remote, if you are in the Samsung ecosystem. Everyone else who buys the HW-H550 will be at the mercy of the supplied remote, which is nice and pebble-sized but a tad cluttered. Connections are as good as you expect at this price: the rear of the bar is home to HDMI, optical and 3.5mm inputs, as well as a USB socket for music playback from a storage device or hard drive. The inclusion of an ARC-compatible HDMI output is also handy for a one-wire hook up to the TV. Unlike the HW-F750, the HW-H550 doesn’t lose face when it comes to the all-important sound quality. Crisp, detailed and as balanced as any rival, the HW-H550 has a likeably confident sound as we spin psychedelic revenge thriller Only God Forgives. As Julian’s violent one-on-one fight with Lieutenant Chang takes place, each blow penetrates the soundfield with brute force and clarity. Subtle detail permeates the presentation too, from the echo of footsteps as the two sidestep each other in the gym hall, to the sliding sound of our hero writhing on the floor. The sub warrants its bulky size as the bass is deep-seated and well integrated, while the higher frequencies prove equally disciplined. The film is heavily reliant on its offbeat, synth-driven score to convey drama, and the Samsung affords it decent pace and detail. Dynamically, it could be more exciting, though, and a bigger, more open presentation would give the viewer a more enveloping experience; the sound can feel a little boxed-in during high-adrenalin scenes. Turning our attention to broadcast TV, there’s decent clarity and weight to the voices of This Morning’s presenters, although outright transparency is hampered by a slightly muffled element. That’s not to say it isn’t capable of giving detail and attack to Eminem’s edgy voice, as we play Survival. It’s got enough fire in its belly to enjoy the track’s fast-paced rhythms. There’s a good amount of clarity, although we’d happily take some more refinement to the sound. The HW-H550 might not have the dynamics or expression to mix it with the big boys, but it has a confident sound and well-thought-out design. If you’re in the market for a decent-sounding, well-designed soundbar this Samsung is worth adding to your shortlist.